Nature contains many clues for how to exist more sustainably on our planet so why wouldn’t we look to it for inspiration when we are designing and innovating? 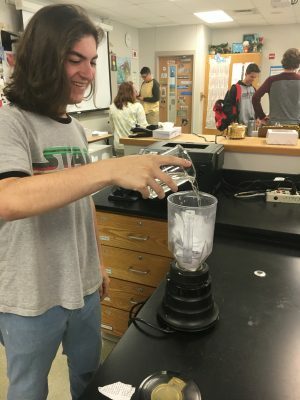 Cedar Park High School students in Leander, Texas did just this as they were designing prototypes to solve campus inefficiencies last Spring. 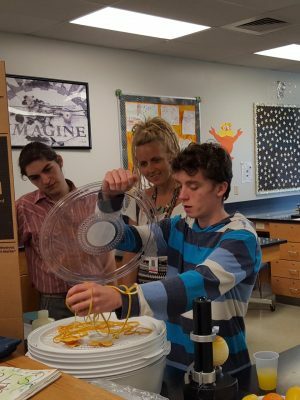 EcoRise’s 2015–16 Teacher of the Year, Shannon McPherson’s students first got a taste for biomimicry—looking at natural processes to design solutions to societal challenges—when she implemented Biomimicry and Science: Applying Nature’s Strategies curriculum, co-authored by EcoRise and the Biomimicry Institute, in her science classroom last school year. In the Spring of 2018, McPherson challenged her students to have a measurable impact on their campus by identifying and finding a solution to an environmental inefficiency through an Eco-Audit. 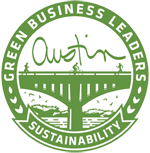 McPherson has inspired her students to design solutions for the Cedar Park High School campus over the past three years using EcoRise Eco-Audits, but this year would be different. McPherson’s class took what they learned about biomimicry and used it as a lens to problem solve and design real-world solutions to the issues they uncovered on their campus through the Eco-Audit process. With a framework inspired by nature, and the chance to apply for Eco-Audit Grant funds from EcoRise to build their prototypes, McPherson’s students also submitted their designs to the Biomimicry Institute’s new Biomimicry Youth Design Challenge. 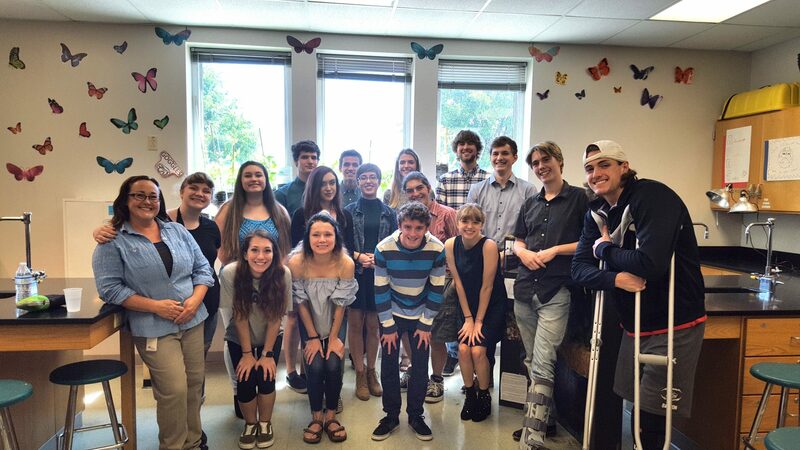 Five student groups applied for and were awarded a total of $2,167.02 in Eco-Audit Grants from EcoRise to make their bio-inspired designs a reality! Combined, the students’ projects were projected to divert 8,090 pounds of waste from the landfill, conserve 2,285 kwh of energy, and purify 1,637 cubic feet of air on their campus. 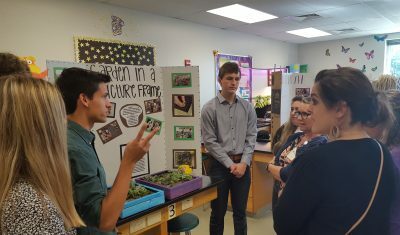 McPherson’s efforts culminated with her students holding a showcase at Cedar Park High School where they showed off the inspired-by-nature innovations to school and district administrators and green professionals from the community. 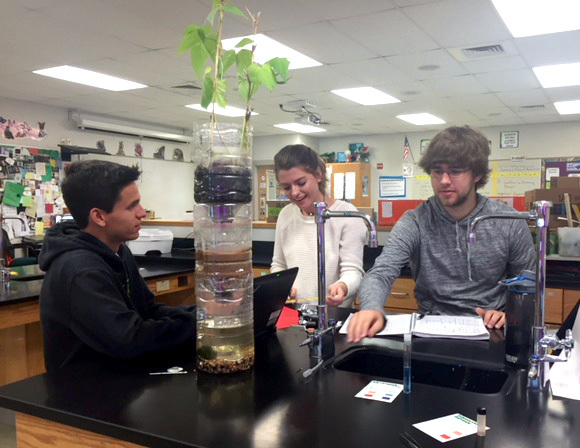 The first student project drew inspiration from plant-based water filtration. 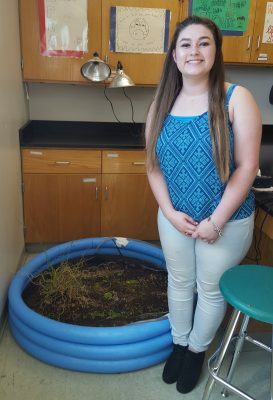 This student group observed significant runoff coming from their school’s agricultural buildings and wanted to ensure that chemicals in the runoff could be filtered out before returning to the watershed. With natural systems in mind, the students designed a model relying on bioremediation, which is the process of deliberately introducing microorganisms to a site to naturally break down environmental pollutants. As a prototype, the group of students constructed a floating island using bamboo, coconut coir, and water lilies. They placed the island in a kiddie pool filled with contaminated water and later pumped out cleaner water. After the showcase, the students made a plan to reach out to A&M Agri-life for assistance in refining their model and implementing the design on campus. The second project used plants to purify over 1,000 cubic feet of air. Through data collection, this group found that certain plants can increase air quality and decrease the number of airborne bacteria and off-gasses from man-made materials. The students constructed eight miniature green walls made from shadow box frames and filled each one with air-purifying plants and succulents. After the showcase, the students gave the boxes to office workers, the school nurse, and other administrative assistants so that the air in these often stagnant office spaces could be naturally purified. Other projects featured at the showcase included two more water filtration prototypes and a method for repurposing used paper products! One student group designed a simple water filter that can be easily implemented in underdeveloped nations. Yet another diverted waste by using fruit peels to clean water. The final project upcycled used paper products into new journals to give to students, which not only diverted waste from the landfill but also encouraged their classmates to recycle. Student groups that presented at the showcase are planning to use their prototypes to educate students and staff on their campus about the importance of water quality, easy ways to improve air quality, and eliminating waste. Biomimicry and Science is also a great way to prepare your students to design-by-nature and enter the Biomimicry Institute’s Youth Design Challenge. Click here to find out more about participating in the design challenge and register to access resources and curriculum for doing so.